The WAI display (short for Where Am I) is a group of colored markers to show you which tracks and/or buses are currently being controlled by which controller/surface. Each controller/surface uses different colored markers. 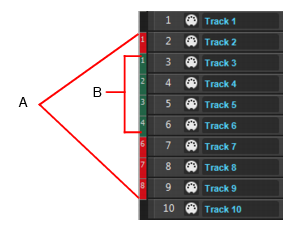 In the following picture controller/surface 1 (blue markers) is controlling tracks 2-5, and controller/surface 2 (red markers) is controlling tracks 7-14. 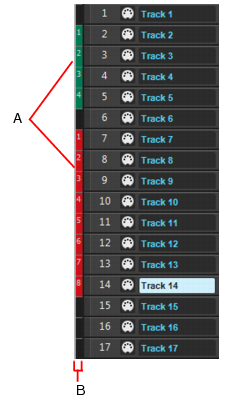 You can drag the markers to different groups of tracks to change which tracks each controller/surface is controlling. You can also double-click the WAI markers to open the property page of that particular controller/surface. If multiple controller/surfaces overlap, the narrowest strip range appears on top of the widest strip range. The following table describes how you can use WAI markers. Drag the WAI markers from one group of tracks to another group, or from one group of buses to another group. Right-click in the WAI strip, and choose Move > [name of controller/surface] > here from the pop-up menu. Double-click the WAI markers for that controller/surface. Go to Edit > Preferences > MIDI - Control Surfaces and select or clear the Track view and/or Console view check boxes in the WAI Display section. Go to Edit > Preferences > MIDI - Control Surfaces and select or clear the check box in the WAI column just to the right of the name of the controller/surface. Go to Edit > Preferences > MIDI - Control Surfaces and select a color in the WAI color column just to the right of the name of the controller/surface.